According to Ed Chalpin of PPX Enterprises, Inc. Jimi played on two tracks featuring Jayne Mansfield on vocals, "As The Clouds Drift By" and "Suey". This was however always questioned in the past as there's no recognizable playing by Jimi audible anywhere on the recordings and apart from Chalpin himself no-one had ever come forward with any evidence of Jimi participating in the recording session(s), nor has Chalpin ever released the tracks in the USA or on any audio format anywhere after the 1967 international single releases. "HOLLYWOOD - Jayne Mansfield, recently pacted to a five-year wax contract by Original Sound, celebrates the event with a dual handclasp with the label`s general manager Art Newberger (left), and its president Art Laboe." Jayne Mansfield died 29th of June 1967, some eight months after the Billboard news item about the supposed release of "Suey" on Chalco Records. A letter 8 from UK Decca to Chalpin confirming the leasing of the recordings "for the United Kingdom and Eire and the Continent of Europe" dated 30th of June 1967 proves that negotiations to release the recordings probably had been underway well before Jayne's passing - though Decca sending the confirmation the day after her death is a very odd co-incidence. The advance for the single from Decca was $500.8 The UK 45 on Decca's subsidiary London label came out on the 21st of July 1967 with further London issues in Italy, Belgium, France & Germany probably released around the same time. The Hendrix fanzine Straight Ahead 1 was the first publication to report on the existence of Jayne Mansfield & Jimi Hendrix -recordings in July 1990 after a copy of a promotional UK London 45 release of the tracks was discovered with a PPX credit on the label. When Steven Roby interviewed Ed Chalpin about the recordings Chalpin asked "How did you get that information anyway?" and added that "I didn't give them permission to use his name". It seems that the first time that Chalpin ever publicly made the claim that Jimi was on the record was during this interview. Chalpin also said the recordings "didn't get released because she died shortly after (in a car accident)." Roby didn't tell Chalpin in advance that he was going to talk about the Mansfield single 7. That adds some credibility to Chalpin's answers to Roby's questions but what Chalpin didn't say is that he had in the past tried to get the tracks released with the help of mentioning Jimi's involvement. "Suey" was offered to the men's magazines Penthouse, Gallery & High Society in 1984 by Brian Graifman of PPX, in letters dated 11 April 1984 (accompanied by a cassette of the track): "Jimi Hendrix...is playing as a session musician on this title. This is a fact and easily substantiated, but we cannot represent it as such due to our subsequent settlements....where we were granted a certain number of albums for licensing. "9 So Chalpin may have been surprised by Roby's question but the answers he gave were not spontaneous as he had been trying to licence the tracks using Jimi's name a few years earlier. Chalpin's claim that he "didn't give them permission to use his name" (apparently referring to the 1967 European London 45 releases) is a tricky one. Chalpin wasn't necessary legally in a position to allow or disallow the use of Jimi's name in June 1967. He had started proceedings to establish the legality of his contract with Jimi on the 22th of May 1967 14 but would Chalpin have risked possible damages by releasing his own records with Jimi's name on them before the court proceedings were over? Jimi recorded further sessions at Chalpin's Studio 76 in July & August 1967 and Jimi's own UK label Track Records released the PPX Curtis Knight & Jimi Hendrix 45 "How Would You Feel" in August 1967 11 as if to validate Jimi's PPX contract. All quite confusing and it makes it pretty impossible to tell who had which motivation for their actions at the time. The comment that the single "didn't get released because she died shortly after (in a car accident)" can be interpreted in two ways. If Chalpin meant that the record was never released anywhere because of Jayne Mansfield's death then that isn't true - the single came out in at least 5 European countries right after Jayne's passing so her death definitely didn't prevent it's release, probably quite the opposite. It seems however most likely that Jayne`s contract with Original Sound was the reason that Chalpin couldn`t release the tracks in the USA in 1967. If the Cash Box news item is accurate and Jayne indeed had signed to a five year contract (thus 1964-1969) it may have meant that Chalpin`s hands were tied when it came to the USA. As to the lack of later releases, as Brian Graifman of PPX admitted in his 1984 letter, "... we cannot represent it as such due to our subsequent settlements....where we were granted a certain number of albums for licensing..." - Chalpin was unable to release any studio recordings after 1968 mentioning Jimi`s name apart from the Curtis Knight masters that he was granted rights to release. "Suey" co-author Douglas "Jocko" Henderson was a well known black dj of whom Jimi for sure would have been aware of even before his association with Chalpin. "Suey" is very much reminiscent of Jocko's style of talking over records on air (listen to a 1957 aircheck here) and the lyrics probably were for the most part (if not completely) written by Jocko: several websites list "make my liver quiver", "make my knees freeze" and "make my back crack" (all part of the lyrics for "Suey") as Jocko's catchphrases. Unfortunately I haven't been able to find a direct printed or recorded quote yet but it does seem like "Suey" would have been written as some sort of an ad / theme tune for Jocko. The planned Chalco Records -label (with a Jocko-themed single as it's first release) would also suggest that Chalpin and Henderson were putting together some sort of a co-venture at the time of the recording of the song which obviously never happened. This could be another reason that the single never got a US release. A big question is, what does the title "Suey" actually mean? It's easy to find a modern day dictionary entry for the word but what did it mean in New York City circa 1965 / 66? Roby & Schreiber date the recording of both "Suey" and "As The Clouds Drift By" to have taken place in late January - early February 1966 2. The time frame was deducted from Jayne Mansfield's visits to New York 7 as neither Chalpin nor anybody else had ever produced an actual date for the session(s). The main evidence supporting this period as the time that the recordings took place is Mansfield's January - March 1966 15 "French Dressing" -revue booking at the New York City nightclub Latin Quarter. Again, John McDermott was finally able to provide more information. A 100% certain recording date could not be determined but it`s, in John`s words, "entirely possible" that the session for "Suey" took place 10 February 1966. AS THE CLOUDS DRIFT BY; w & m Sandy Brodsky. © P.P.X. Pub. Co.
Ed Chalpin claims in the Straight Ahead interview that both songs were recorded in the same session and both songs feature Jimi. "As The Clouds Drift By" however was copyrighted 15 March 1965 and "Suey" 3 January 1966, nine months apart, and the same session claim was also disputed by John McDermott. The copyright of course does not tell us when the tracks actually were recorded but with the dates so far apart it's very unlikely they were cut at the same session. It seems even more unlikely when you listen to the tracks back to back, they have completely different instrumentation and style from each other. - single released in April 1966. "How Would You Feel" was recorded on the 6th of October 1965, the Copyright Office registration for the track is dated 25 October 1965, circa three weeks after the recording date. The exact recording date of "Welcome Home" is unknown but must have been recorded between October-November 1965, the track was copyrighted 2 December 1965 which would mean it was registered 1-2 months after the session. - the single was released in August / September 1966. RSVP publishing contracts were signed on 21st of June 1966 and a tape log mentioning the tracks exist with a 20 June 1966 date so the recording probably took place in June 1966. The Copyright Office registrations for "Hornet's Nest" & "Knock Yourself Out" are dated 30 August 1966 & 6 September 1966 so circa 2 months after the probable recording date. So based on other PPX copyright registrations one could assume that the Mansfield tracks would have been copyrighted roughly 1-2 months after they had been recorded - which contradicts the available information about the sequence of events. "Jayne Mansfield, currently starring in Herman Wouk`s "Nature`s Way" at the Guy Palmerton Lake Whalom Playhouse is - as her husband puts it - "energetic and can`t stand still." Therefore, he does not envision any sedate domestic scenes after the birth of her fifth child due in about 2 1/2 months. Miss Mansfield intends to continue working this summer for another month and then return to work two weeks after the baby is born. "A busy schedule is awaiting her" ... "Record - cutting: "Til The Clouds Roll By,"
"The couple`s home in New York City is on 69th and Park Ave"
So, what can we deduct from this? Jayne had clearly been informed that she was going to record "As The Clouds Drift By" (the creative spelling of the song title is probably down to the reporter who wrote the piece). The interview was published in 28 July 1965, an earlier issue of the same newspaper on 22 July 1965 featured an ad for "Nature's Way" stating that it starts at the Lake Whalom Playhouse on Monday 26 July 1965. So the newspaper interview was probably done on 26th or 27th of July 1965. 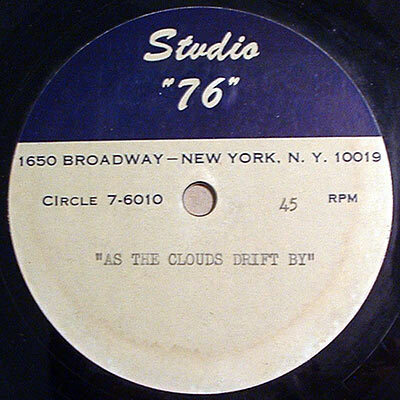 "As The Clouds Drift By" clearly hadn`t been recorded yet despite of the March 1965 copyright registration so the session must have taken place after 27 July 1965 and not early in the year (like I previously believed). As Jayne Mansfield had an apartment in New York City at the time she could also have been in the city at any time, not only when contracted for an appearance. Which again makes it possible that the track might have been recorded after Jimi started working for Chalpin - though there still is no evidence that he plays a single note on the recording. So the conclusion is that in this case the copyright registrations offer very little proof for any dates, it seems Chalpin first registered the songs well in advance of recording them. The 10 February 1966 recording date for "Suey" seems like the most reliable information that we have and there is no firm recording date for "As The Clouds Drift By" though late 1965 seems likely. The guitar & bass playing on Suey is all quite basic rhythm and there is very little about the track that would make one believe Jimi is playing on it if it wasn't for Chalpin saying so. According to Chalpin Jimi "did all the guitar parts", again unclear whether he means Jimi played just the two rhythm guitar parts or also the bass guitar part 13. Chalpin says he has photos of the session but that Jimi is not in them though according to him Jimi was present at the session 3. Ed Chalpin: "I recall, I did give him some work where he backed Jayne Mansfield, and I had to make sure he did the track without her being present cause, eh, you know, it might have been offensive. The way he was dressed and looked, in those days, it wasn't really in yet. Later on it became everyone had to dress that way or look that way otherwise they wouldn't be considered an artist but in those days it might have been considered offensive so we had to do it (by?) laying the track first and then bring her in." Chalpin again later contradicted himself, this time about the photos from the session. John McDermott: "All of Chalpin's photos are now owned by EH but none of the Mansfield session were included [or made available to us]. That is not to say that something did not exist at some point but he claimed to not have any images of Mansfield other than press photos." 18 So whether there are photos from the session or not remains a mystery but if they do exist Jimi is not in them. Which supports the theory that the vocals were recorded in a separate session. If we assume the recording took place weeks or months before the copyright registrations the session(s) for "Suey" could have taken place circa November-December 1965. This would be the exact timeframe of the 1965 Curtis Knight & the Squires sessions but it conflicts with the 10 February 1966 date that McDermott thinks is likely. However like already determined in the case of "As The Clouds Drift By" the copyright dates do seem useless in this case and 10 February 1966 as the recording date for the backing track is the best information that we have. Even if the basic track was recorded in 1965 Mansfield could have added her vocals in January-March 1966. The backing track of "Suey" is a very basic repetitive instrumental and could well have been cut without Jayne being present. In fact Chalpin's main business had been cutting backing tracks (see the "PPX backing tracks" -page) for licensing to other companies so their artists could record their vocals on top. Thus it would in no way have been odd for Jimi to have recorded an instrumental backing track that Chalpin would later have found a vocalist for. John McDermott had the following to say about the session: "The basic track was cut live so Jimi did not play the bass. I would agree that Jimi was unaware of the final use of the "Suey" track. " 18 So all evidence seems to point to the backing track being cut without Jayne Mansfield being present. The bass on "Suey" is odd: the slide at the end of the verses sounded too "boomy" to me to have been played with a regular electric bass so I thought it might have been played on an acoustic upright bass. I asked a few musicians and people in the know 6 to give their opinions and the results were interesting. A semi-acoustic fretless bass was one suggestion, an upright bass another, a trombone was suggested, one suggested a normal electric bass and two people (independent from one another) suggested that the main riff was played with an electric bass but the "slide" part was actually done with a percussion instrument, either by running one's hand across a drum skin or using a tunable percussion instrument, perhaps a timpani. So, Ed Chalpin variously states that Jimi was and wasn`t present when Jayne recorded her vocals. Either way, if Jimi appeared on a record by Jayne Mansfield then why didn't he ever mention this, not in a single interview? When the Jimi Hendrix Experience was put together in 1966 the biographies of Jimi done for the press did mention all the big acts that he had played with in the past but no mention was made of Mansfield, surely a very interesting name from a PR point of view? And when Jayne died in 1967 and the PPX 45 was released in the UK (while Jimi lived in England) there still was no mention of her from Jimi in any interviews. Even if Jimi was unhappy with his contribution to a musically less than spectacular recording surely someone with his sense of humour couldn't have resisted making a mention of the session at some point? 7 email from Steve Roby 31 October 2013 in reply to my questions about the Ed Chalpin interview and the info presented in the book "Becoming Jimi Hendrix" by Roby & Schreiber. 10 The "Too Hot To Handle" -cd is beautifully packaged and was available in your regular record stores but includes no licensing info, no credits, no contact info for the label - all suggesting it's a pirate. The Mansfield 45 tracks are sourced from a tape but they are hissier than on the 45 releases suggesting that the master tapes weren't used. Since PPX had over the years send out multiple copies of the tracks on tape (each men's magazine that PPX flogged the recordings to in 1984 received a copy) it would be no wonder if one of the tapes ended up on a pirate cd. 13 in the Straight Ahead July 1990 (volume #16) interview transcription Steven Roby quotes Chalpin as saying Jimi "did all the guitar parts" and in the book "Black Gold" Roby writes that "Chalpin eventually revealed that Hendrix played bass and then added a guitar track to Mansfield's vocal" (page 44). The track actually has 2 guitar parts and one bass part so both descriptions are a bit vague. 15 Jayne Mansfield's "The City Of New York Department Of Licenses" "Application Cabaret Or Public Dance Hall Employee's Identification Card" dated 20 January 1966 and stamped with "issue temporary card" was sold by www.legendaryauctions.com. 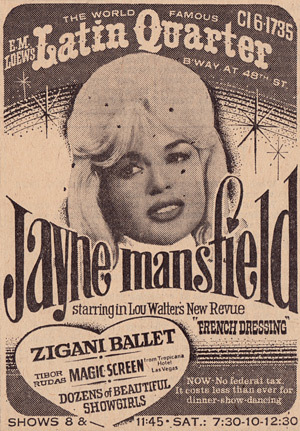 "Jayne Mansfield: A Bio-bibliography" by Jocelyn Faris dates the "French Dressing" -revue shows as having taken place 24 January - 8 March 1966. However, she quotes a review of the show published in the "New York Journal American" 24 January 1966 which mentions a "sold-out house". If the show opened on the 24th of January the newspaper couldn't have printed a review in the same day`s issue unless the reporter saw a press preview, the comment about the show being sold out however suggests the reporter attended a normal general public performance. But as the three reviews Faris quotes in the book all were published between 24-26 January it would seem at least her opening date is roughly correct as reviewers would have attended the first few showings. Roby & Schreiber date the appearances 18 January - 28 February 1966, the opening date of 18 January is unlikely to be correct, It predates the newspaper reviews by almost a week and it also predates the cabaret identification card application by two days.